When Meyer came to America she carried Froebel's ideas with her. Margarethe employed Froebel's philosophy while caring for her daughter, Agathe, and four neighbour children, leading them in games and songs and group activities that channeled their energy while preparing them for school at the same time. Other parents were so impressed at the results that they prevailed upon Schurz to help their children, so she opened a small kindergarten, the first in the United States. Like most of the early Kindergartens in the United States, it was conducted in German. The kindergarten in Watertown continued until World War I, when it was closed because of opposition to the use of the German language. She later said that Froebel credited her with expressing his views better than his own books had. Her work certainly gained an audience; kindergarten became an accepted and integral part of American education and an accepted course of study for elementary teachers. In 1859, Elizabeth Peabody visited the Schurz home, and was impressed with the Agatha's ability and maturity. Mrs. Schurz told her about Froebel's teachings, and Peabody became a convert to the kindergarten cause. While Mrs. Schurz's health became such that she could not continue with her work, Peabody became a nationally known advocate of early education, and helped bring kindergartens into widespread use. 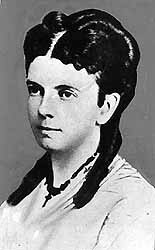 Margarethe Meyer Schurz died in Washington, D.C., at the age of 43. The memorial tablet, dedicated in 1929, rests only a few feet from the site of the building where she ran her kindergarten -- the first ever in America. "In memory of Mrs. Carl Schurz (Margarethe Meyer Schurz) Aug. 27, 1833 -- March 15, 1876, who established on this site the first kindergarten in America, 1856." The restored first kindergarten building was moved to the Octagon House grounds from its original site in downtown Watertown, corner of N. Second and Jones streets in December 1956, just 100 years after its founding in 1856 by Mrs. Carl Schurz. It was dedicated on September 15, 1957. The interior, a living room used as a classroom, is furnished in the period and portrays a kindergarten class in progress.